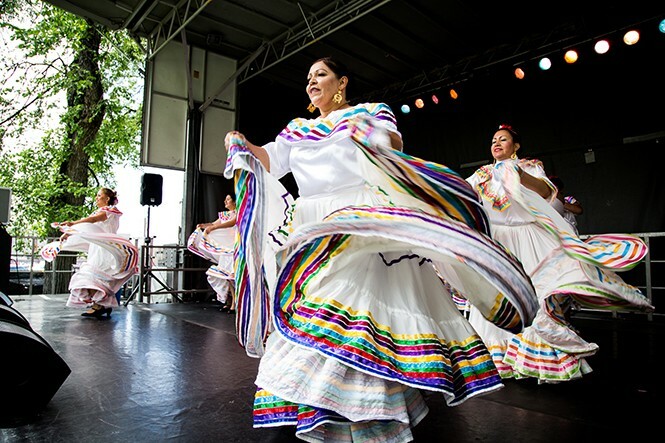 Friday, May 18, 5 p.m.-10 p.m.
Saturday, May 19, noon-10 p.m.
Sunday, May 20, noon-7 p.m.
Ballet Folklorico performs at 2016 Living Traditions Festival. Megan Risbon recalls at least one thing very specifically from her first visit to a Living Traditions Festival, back when she was a college student. "I remember I bought a bonsai tree," she says with a laugh, "and it died. But it was my own fault." Risbon is much more connected now to the "living" part of the Living Traditions Festival. The Vernal native—who spent two years as director of the Utah Pride Festival—began her position in January 2018 as arts events production manager for the Salt Lake Arts Council, which includes overseeing the celebration of cultural crafts, performance and food that launched in 1986 and now regularly kicks off Salt Lake City's summer festival season. The festival has become a well-oiled machine, with seasonal staff providing a foundation of familiarity with operations and state folklorist Adrienne Decker working year-round to identify the craft artists invited to participate. "It's been very easy for me to come in and go, 'OK, for this first year, let's do this the same way,'" Risbon says, "'and we'll look at the process and maybe make some changes for 2019.'" That doesn't mean a 2018 Living Traditions Festival is going to be identical to a 2017's or earlier fests. Every year finds more groups interested in participating, and Utah itself continues to change in terms of ethnic groups with enough of a community presence to warrant inclusion. Risbon says she works closely with entities like the Department of Workforce Services and its refugee coordinator to identify new immigrant populations in the state. These connections have led to new participants like a Sudanese craft artist who is one of the "lost boys," or a Hmong woman who learned her embroidery skills while growing up in a refugee camp. The Living Traditions program is also looking to expand into a year-round endeavor, including the Mondays in the Park concert series at the Chase Home in Liberty Park, and a planned concert celebration at the Grand Theatre in the fall. "When I started," Risbon says, "part of my plan was to do more events around the city. Our strategic plan identifies a need for more events, and Living Traditions fits very well into what we want to do." For the moment, however, the focus remains on the 2018 festival, which includes as many as 150 performers representing more than 90 different cultural and ethnic groups. That number might seem overwhelming, but one of the important goals of Living Traditions is to provide an educational opportunity for attendees who might not necessarily understand the cultural distinctions between peoples that can be grouped into a larger category. "In the Polynesian community," Risbon says, "we have a Tongan dance group and a Samoan dance group, and they're very different. People might think, 'Oh, it's the same,' but the outfits are different, the dances are different, the drumming is different." That educational component extends to a program that invites more than 1,500 school children from around the Wasatch Front to the festival on Friday, May 17, before it opens to the general public. "[The students] get to talk to the different craft artists, see different performances," Risbon says. "[The artists] really get down on their level, to explain what this means to them, and how they learned this. "We have a lot of opportunities for people not just to see these performances," she adds, "but to come and talk to these artists, and find out why this is important to them. They're there not to sell or make money, but to show their work, and to have questions asked of them, so there isn't this divide, or this misappropriation of cultures." Risbon jokes about how people she speaks to from other places are surprised to learn there's a multi-cultural festival of this kind in Utah, but the relative dominance of white European ancestry in the state is part of what makes it so important, especially to someone like Risbon who remembers the impression Living Traditions made when she first attended as a college student. "I grew up in Vernal, which is even more white and secluded," she says. "There wasn't a lot of diversity in my community. When I moved out here for school, [Living Traditions] became something me and my friends did every year." The director of the festival might be new to the position, but she realizes that this long-running event can continue to make a similar impression on others, while showcasing cultural art forms that have lasted much longer. "These traditions have existed for so many years and been passed down for a reason," Risbon says. "These are the ways we communicate, the ways we show who we are and what we stand for."